I should have known that the little challenge I put up last week wouldn’t so much as wrinkle the brow of the bug-blogo-sphere’s best. The Atavism‘s two homes means there were two winners. Ted MacRae of Beetles in the Bush chimed in at he blogspot version, correctly identifying the insect as a “bark louse” or psocopteran, and recognizing those stubby white protrusion as yet-to-be expanded wings . Morgan Jackson of Biodiversity in Focus did the same at SciBlogs. Thanks too to Deborah from Bee of a Certain Age, who hazarded a guess that those white protrusions might be eggs. Certainly a more reasonable guess that my own first thoughts at seeing these bugs crawling over the the Big Tree* in our garden. The plump abdomens and long antennae made me think of the large (but certainly not GIANT) springtails. Ripping up a couple of pieces of bark revealed a whole colony of these odd-looking bugs, and evidence for just how wrong I was. The adults have wings, which they hold tent-like over their bodies. Insects are the only invertebrates with wings, so, since spring tails aren’t insects, my first guess was horribly inaccurate (glossing over about 400 million years of evolutionary divergence). A couple of weeks ago I gave Veronika Meduna a tour of our garden and its bugs, and I gather you can hear the result on Radio New Zealand’s Our Changing World next week. While I was catching my breath between talking about the mating habits of spiders, and how our native slugs are much more sluggish then their introduced counterparts she asked the obvious question – “why?”. Why do I care so much about odd little creatures like bark lice and slugs and spiders? I’m not sure I managed a coherent answer at the time, but I can tell you now, spineless creatures need evangelists because most people have a very skewed view about the way biology works. If your vision of biodiversity is limited to pandas and dolphins and lions and tigers then you are missing out on millions of other ways to be alive. Take bark lice as an example. I’ll admit that I’d never given these creatures a moments thought before running into them last week. But, in researching this post I found out there are more than four thousand psocopteran species. 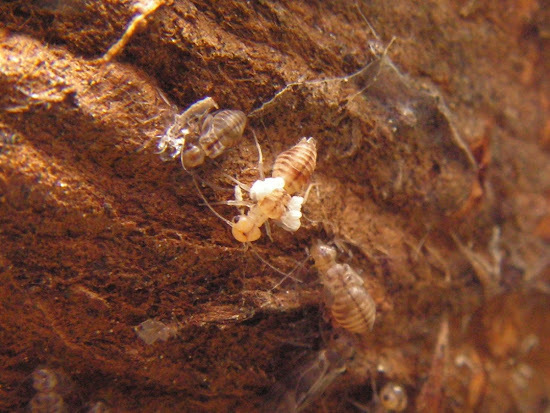 That is to say, there are almost as many bark lice species as there are mammals – all the lions, tigers, bears, dolphins, whales, marsupials, rodents and bats in the world add up to about 5 400. That matters because species are the fundamental units of biological diversity. Each species represents a distinct evolutionary lineage – free to take up different ecological niches, develop new morphological features or occupy a different geographic range. And that’s just bark lice! For me, this chart is the best answer to “why?”. How can you know you share the world with all this extraordinary diversity and not want to want to spend your time working out how it got here? Since I’m going kind of crazy over the awesomeness of your treemap and my inability to replicate it, what software did you use? And would you be willing to give a tutorial? The treemap is from the R library…. “treemap”. There is an example of its use here. The trickier thing was parsing a species list into taxonomic ranks, if I get moment in the next couple of days I’ll write up a tutorial on what I did. I KNEW it. Somehow I knew it had to be R. That program can do everything and make coffee, too. I really need to learn it. Thanks! 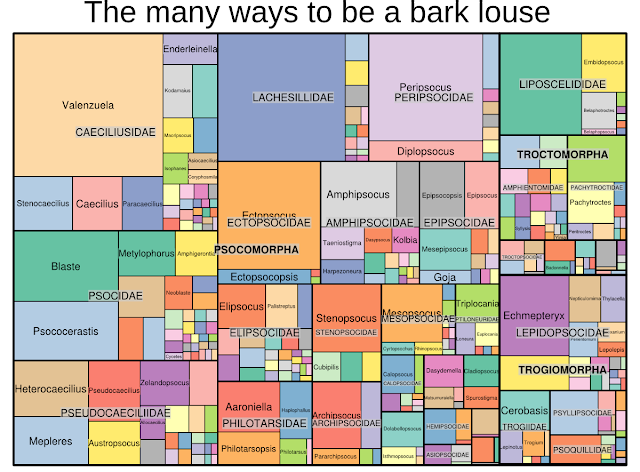 That treemap would make THE BEST super nerdy quilt for an entomologist! (Okay, I’ve been dying to make a quilt recently and I am seeing them everywhere…) I’m very happy to see a post about barklice too. They’re wonderful! Love this post! I wish I had seen it earlier. Where were these psocids found??? They look vaguely like lachesillids, but I’d have to have a closer look. Love your psocid map too. Not many people care about Psocoptera so it’s rather lonely here in psocid land. Glad you enjoyed the post! These are from my garden in Dunedin, New Zealand. Sadly, it seems not many people care about Psocoptera down here either – I don’t think anyone is working on our native ones at present. Wiki species has a list which probably comes from the Fauna of New Zealand (i.e. it will be accurate as far as it goes).